My guest today is Ann Page, a newly published Minnesota author. Welcome, Ann! We’re excited to get to know a bit about you. Where did you grow up? Prior Lake, Minnesota. I still have family there. What are some memories you have of that area? I loved being near the lake. In the summertime, my siblings and all the kids in the neighborhood swam and played “King of the Raft” most days. Where do you live now? On a small lake in Chanhassen with my husband, Mark. What did you want to be when you grew up? I always enjoyed writing, but never really knew how to get started or how to get the feedback I needed to improve. What do you love about living in Minnesota? What are you not particularly fond of ? I love the summers. I’m not particularly fond of the winters. 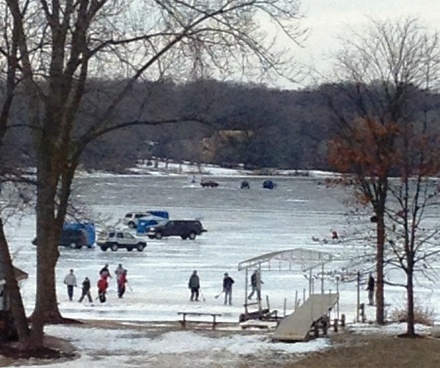 The snow is fun, and playing broomball on the ice is fun, but the whole season last too long, in my opinion. Tell us about your writing journey. I hired a life coach 7 years ago and told her how much I liked writing. Her “assignment” was for me to sign up for a writing course by the time we met the following week. I showed up with a brochure offering a novel-writing course. “But,” I told her, “obviously I can’t write a novel.” She said she didn’t see any reason why not. I took the course to prove her wrong. But, she was right. I did write a novel. I finished it, but it’s in terrible need of revision. The sheer size of the task overwhelmed me and I haven’t picked it up since. But you didn’t give up writing completely at that point. I thought I might be able to stick with something shorter. I heard “A Cup of Christmas Tea” on the radio a few years ago. I’d never heard it before. It reminded me of the old Dr. Seuss books, especially “How the Grinch Stole Christmas.” I’ve always loved the cadence and the rhythm and rhyme of those stories. It inspired me to try writing a Christmas story that rhymed. My first attempts were terrible, but, luckily, I didn’t realize it right away. What kept you going? A friend, Tony Aarts, encouraged me quite a bit in the beginning and gave me some crucial advice. I learned a lot by reading other writers’ websites and blogs, and reading books about writing. I also got some terrific advice from my critique group partners and from other members of SCBWI (Society of Children’s Book Writers and Illustrators). I wrote a 350-word rhyming story called Maggie’s Christmas Ride. Then I read an article that said agents prefer a series of books so that their time investment in you pays off, i.e., you’re not a one-book wonder. So I wrote two more Christmas stories with the same characters. It took a couple of years to get all three stories into decent shape. How did you get Maggie’s Christmas Ride published? I didn’t have much luck submitting the manuscripts to agents or publishers, but I found MeeGenius, a digital publisher. They were willing to create the illustrations for me and publish an eBook. Since illustrations for a picture book can cost from $5,000 to $10,000, this seemed like the perfect solution. Wow! I had no idea it was that pricey. Are you happy with the illustrations? Bong Redila is the illustrator of my first book and I’m thrilled with his work! I’m hoping he’ll be able to illustrate the other two books in the series. What is a lesson you learned during that journey? I learned that if I don’t have confidence in myself, I can’t expect anyone else to. I learned that, at some point, you have to bare you soul to the world, show them your work, and get some feedback. I learned that input on my work consists of suggestions, not commands. I can pick and choose which suggestions I choose to implement. In the beginning, it’s hard to not take people’s comments personally, but you have to remember that they’re trying to help you achieve your best…and there’s always room for improvement. Those are some great lessons to have learned along the way. Tell us about your current work. 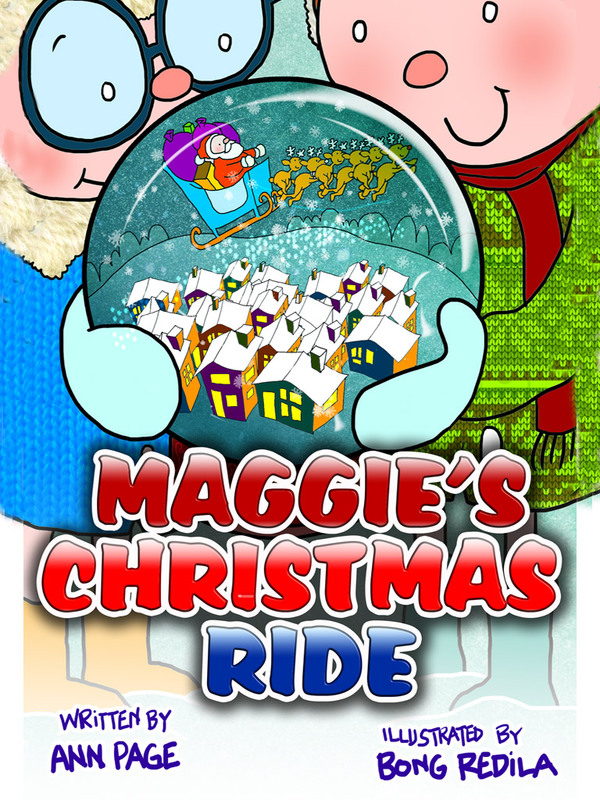 Maggie’s Christmas Ride is available right now through MeeGenius, and will be available on Amazon and through several book retailers before summer. I’m also working on getting Maggie’s Christmas Ride into print (a paperback version) through my own publishing house, Floating Raft Press. The next two books in the series will be published by MeeGenius as eBooks in December 2013. What are your future plans and goals around writing? My next two eBooks come out at the end of this year. I’ll decide, based on sales, whether I put those books into print as well. I’m hoping the sales will be high enough to justify it. I’m working on a couple other children’s books, but they’re not holiday-oriented. I’m also working on a non-illustrated gift book for people of all ages. You are one busy lady! So tell us about something you’d like to experience in Minnesota that you haven’t yet. I’m a terrible water-skier. Even though I grew up on the lake, we never had a speed boat. I’ve been working on slalom skiing and I’ve been successful for only brief periods. This is my summertime goal. One of my neighbors has promised to coach me this summer, so watch for announcements on Twitter (@AnnPage10), because I’ll definitely tweet about it. And hopefully you’ll post pictures of the big event on your website. What’s something most people don’t know about you? A few years ago I developed a rare voice disorder called spasmodic dysphonia. It makes it very difficult for me to speak. I get injections in my larynx four times a year to make the vocal chords relaxed enough for me to talk. If you meet me during a good part of the cycle, you’ll never know. Otherwise, you’ll probably think I have a cold. Thank goodness for medical advances! Thanks, Ann, for sharing a bit about yourself and your writing journey. To find out more about Ann, check out her website. She welcomes comments on email and Twitter. To find out more about her new book, go to Maggie’s Christmas Ride. Leave a comment or a question for Ann to be eligible to win a free ebook copy of Maggie’s Christmas Ride. Thanks for stopping by! See you back here on Thursday for some fun facts about Minnesota weather.